Fjällräven Polar is a 300km long adventure steering dog sleds across the arctic tundra from Signaldalen, Norway to Jukkasjärvi, Sweden. The trip altogether is 7 days including few days of basic training about the outdoors and the equipment used on the adventure. Training and gearing up happens in Sigtuna, Sweden, where the group comes together for the first time. The adventure itself is 4 days long and starts after the group is equipped and trained for the journey. The aim of the event is for more people to discover how fantastic outdoor life can be in the winter, and to prove that anyone can enjoy the adventure of a lifetime if they have the right knowledge and the right equipment. The group arrived to Sigtuna, Sweden on a Monday to meet everyone and prepare for the adventure in the North by getting some basic outdoor training from Johan Skullman. It was exciting getting together and finally start getting the right mindset for an adventure like this. It was fun to listen advices from Johan, who is one of the top outdoor guides in Sweden. Not often you get to hear the stories behind the development of the gear. There’s a lot of thinking and testing in the products and all the details are there for a reason. We took an early flight to Tromsø, where a bus took us to Camp Tamok, where we got the tents and shared equipment for the teams like stoves etc. This was our first touch to the wild as we spent the first night in tents after Johan shared his knowledge once again for setting a camp out and showing how the stoves were used. It was nice how you could be a first timer for all of this and they wouldn’t just send you off to the wild on your own without you knowing how all the things work. Things were now getting really real and we were about to head out early in the morning. First morning in the tent and man it is a good place to sleep! Unfortunately we had to wake up really early as we had some distance to cover that day for our first camp spot on the dog sleds. 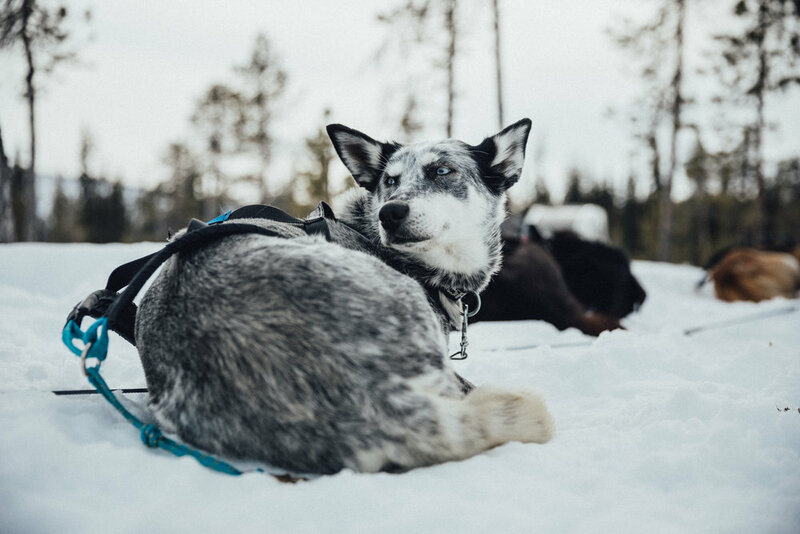 We took off from the Camp Tamok and started heading to the starting spot in Signaldalen, where the mushers and dogs were waiting for us. As we were driving, you could totally feel the anticipation in the air. People were looking through the bus windows and while approaching the parking lot, the anticipation turned into more vocal excitement. When the bus doors opened, you could hear the dogs being at least as excited as us to get going. We packed all of our equipment in to our sleds and attached our dogs to the towline. It was time to go! After getting all the hassle out of the way, you realise that this is it, this is what we’ll be doing for quite a while. It takes some time to figure out what’s going on and how things actually work in real life. After you get comfortable, you start sensing the amazing feeling what being right there, in the middle of nowhere gives you. It is unforgettable! Throughout the adventure we see some of the most amazing landscapes you can have. We experience weather from crazy winds and snowstorms to beautiful Spring weather. 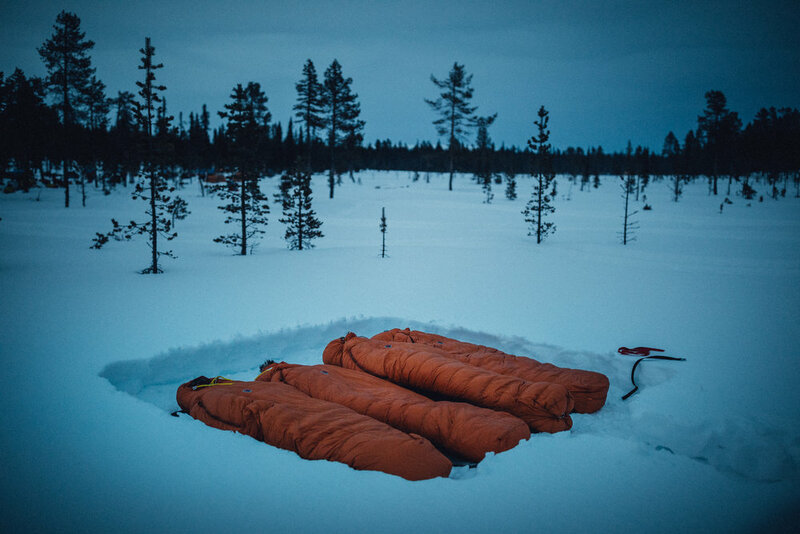 We sleep in winds blasting at storm speeds to a beautiful calm night under the Northern Lights with no tent. It takes a lot of work to do an adventure like this. It is not always easy to take care of the dogs in the evening after a long journey, when you might want to just sit back and relax. Luckily we slowly got better and faster at setting up the camp, feeding the dogs and actually got to sit down and share some amazing moments eating dinner and making campfires with the crew. These are the moments that make an amazing trip, a trip that I’ll remember my whole life. 300 kilometers later we arrived to the finish line and suddenly the journey was over. It was time for celebration. We had sauna waiting and an amazing dinner set up. It was nice going through everyones experiences and what they had gone through. Find more about the Fjällräven Polar here. Entry to Fjällräven Polar is by votes and jury selection and is region based. Two people from each region are selected. The first from each region is chosen by total number of votes acquired on the Polar application portal. The second one will be handpicked by the Fjällräven Polar jury. I highly recommend applying for next year and as long as it’ll be held! It’ll be an adventure of a lifetime! I'm happy to walk away with great memories and great new friendships!